It started with a field trip to historic Williamsburg and Jamestown, Va., and a shard of unearthed blue-and-white pottery that a school girl wanted so much but knew she couldn’t have – because it was a priceless, authentic piece of America’s history. Kim DiMaggio still remembers the field trip. And she remembers her grandmother’s love of beautiful china. 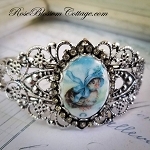 Now her business, RoseBlossomCottage.com, an affiliate of the shopping site and women’s business network Make Mine Pink, helps others live every day with the beauty and spirit that radiate from such simple things as a piece of china or glass button set in sterling jewelry, charms that feature old postcards and photos, and plaques made with vintage prints. Rose Blossom Cottage started as a bricks-and-mortar store in 1991, sold things on E-Bay for a while and now is a website-based business that attracts customers who, like DiMaggio, draw inspiration and energy from even the smallest antiques. “We are a cottage industry and we make our broken china jewelry from scratch,” she explains. “We take pride in our `Made in the USA’ tag. We use fine silver and sterling in our pieces and we are huge believers in repurposing items. Customers quickly become friends, too. “We laugh and celebrate with our customers.